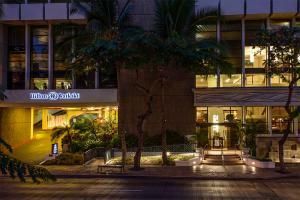 Located in the heart of Waikiki Beach, this hotel offers breathtaking ocean and mountain views from the 37 story, 601 newly renovated rooms. Enjoy the Hilton Serenity bed, 42-inch plasma HDTVs, and many state-of-the-art design features. To unwind, relax on your private lanai, take a dip in the swimming pool or have a meal in our famed MAC24/7 restaurant, featured in the TV show "Man vs. Food". Near International Market Place & Honolulu Zoo, 1 1/2 blocks from beach. Approximately 35 minutes from airport. MAC24/7 Restaurant, lobby Lounge, Hang Ten Pool Bar, and In-Room Dining.